JI500 (formerly “Johnson’s Indy 500”) was founded August 6, 1998 as a way to share Indianapolis 500 history on the burgeoning internet. I began compiling statistics about the Indianapolis 500 and Indy car racing in 1985. In days when newspapers (“The Indianapolis Star” and “The Indianapolis News” in particular) were king, and the month of May mail subscription was the best (and only) way to get daily information from the track. 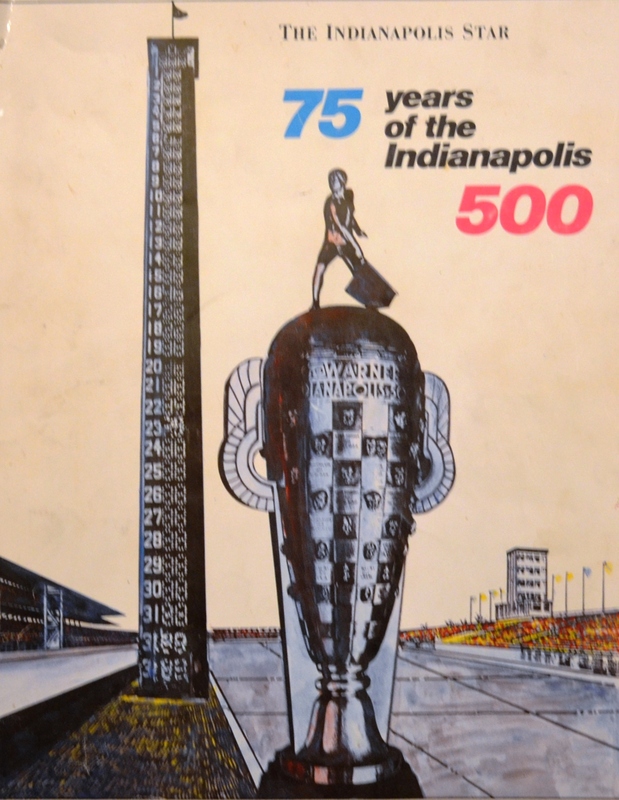 It was “The Indianapolis News” 75th Anniversary Indy 500 book that specifically grabbed my attention back in 1986. The final page was a huge statistical list, compiling winners, track records, lap leaders, and numerous other treats for the stats junkie. Very quickly though, reading excitement turns to disappointment when you realize the stats are one (or more) races out-of-date. 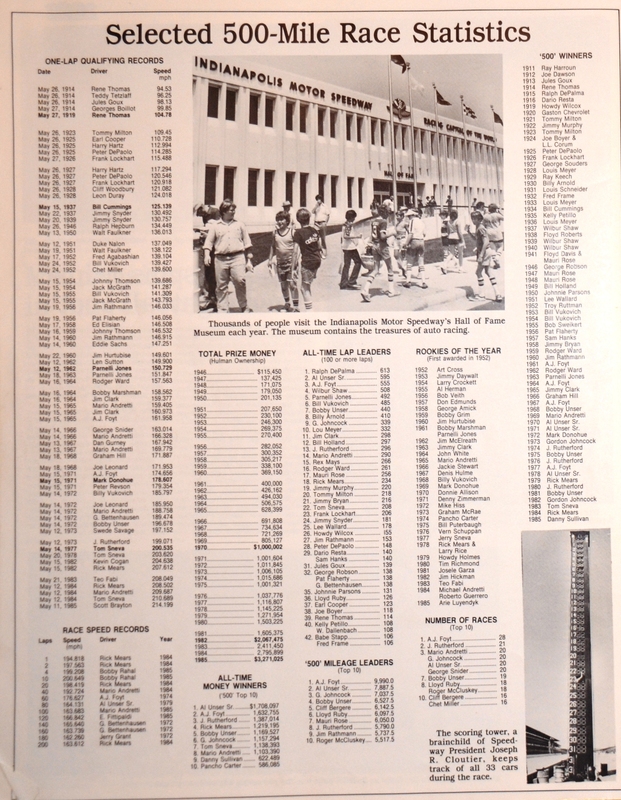 The Indianapolis News 75th anniversary book from 1986. The stats page from the ’86 News book. The stats ended with the 1985 race. One of the stats pages from The Indianapolis News, ca. 1989. At its inception, the site’s primary focus was statistical charts, lists, box scores, and other pertinent information regarding the 500, the Brickyard 400, and other events at the Speedway. The premise that being on the internet, and being instantly editable, that stats could be up-to-date at all times, and corrected immediately if an error was found. Likewise, since the internet was still in its early days, not much racing information was readily available. In the early/mid-1990s, those were concept that baffled the mind, and almost immediately my hand-written notes and countless charts could be shared with the rest of the world – although I didn’t think many people would be interested. Back in the mid/late-1990s, those free personal web site hosting services (Geocities, for one), were easy to start-up, easy to edit, and most importantly – free. The original site hit its peak of popularity in 2005. The busiest traffic day ever was that year’s race day (May 29, 2005), and I’m quite sure “Danica Mania” had something to do with that. 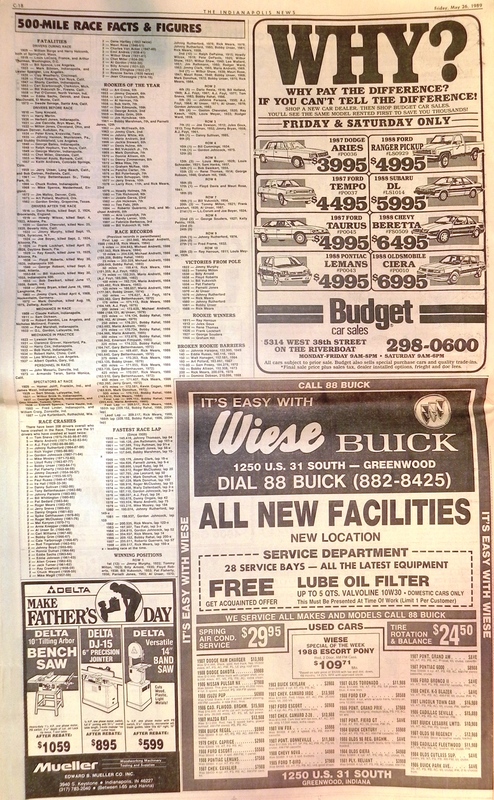 The site was commended for having a large volume of information, as pointed out in this DallasNews.com article from 2001, but it was no-frills, and visually unappealing. It was quite amusing when the site was linked as an example (by some web site designer) as a site with ‘great content, but lousy visuals’. (If I can ever find the link to that article, I’ll add it). Perhaps the most public nod to the site came on Pole Day weekend in 2003. ABC Sports seemingly used the Nostalgia page to populate their Indy 500 facts ticker that scrolled on the bottom of the screen. I had the chance to ask them about it years later, and while they weren’t sure that’s where they got it from, they admit they ‘probably did.’ It didn’t matter, it was positively flattering. The ease of editing, the traffic reach, and the simple form was what made the transition so smooth. However, the one thing that attracted me there the most was Wiki’s desperate need for accurate and factual Indy 500/Indy car content. What they had ca. 2006 was a hodgepodge of cheap cut & paste jobs, grossly incomplete information, and some of it was just a farce. Many of editors that contributed to Indy car related articles were not very knowledgeable, were not very active, passed urban legends off as fact, and spent more time squabbling about relatively mundane details – meanwhile nothing was getting done. It took about 7-8 years, but I finally got WP’s Indy 500-related articles in presentable shape. And since very few editors are even active anymore in the project, there is little to no threat of the Indy 500 articles being ravaged with so-called vandalism. I think the whole WP effort was worthwhile when I got what I felt was the ultimate compliment. Donald Davidson, who at one time seemed to despise Wikipedia, said on his program about Wiki’s Indy 500 content, “It’s much better than it was” (The Talk of Gasoline Alley, WFNI, July 24, 2013). I took that as a personal complement, seeing as that I did most of that work all by myself. Around the same time, the long-since antiquated, and technologically decrepit Yahoo/Geocities! server was finally going to be shut down. That meant the end of the original JI500 site would come in early May 2009. It came as sort of a relief, as the maintenance of the site had become a bit of a burden, there was no help to be found, and financially it made no sense to continue on with the site. In addition, with the amount of reliable racing-related information now flooding the internet, the site no longer “needed” to be around. There were plenty of other (and admittedly better-looking) places to get up the information. I made the announcement that the site was shutting down, and the response was overwhelming. The traffic I never knew it had came out in support, and within days, the site was rebooted with the help from the kind folks over at TrackForum. I couldn’t quit, the readers wouldn’t let me, and I couldn’t let them down either. And also, I did want to set the record straight on one thing. One fine poster over at Crapwagon seemed to think that the TF guys controlled the content when it was hosted there. They did not. I did appreciate the mention, however, and truthfully hold no ill will against the person who wrote that. On October 16, 2011, after the Las Vegas tragedy that took the life of two-time Indianapolis 500 winner Dan Wheldon, the original site was put on hiatus in his memory. Just as had been the case three years earlier, the maintenance of the site had become a burden. Furthermore, the content had been migrated over to Wiki, and there was not much left. In its stead, the focus of research for the site narrowed particularly on documenting the radio program “The Talk of Gasoline Alley” starring Donald Davidson. 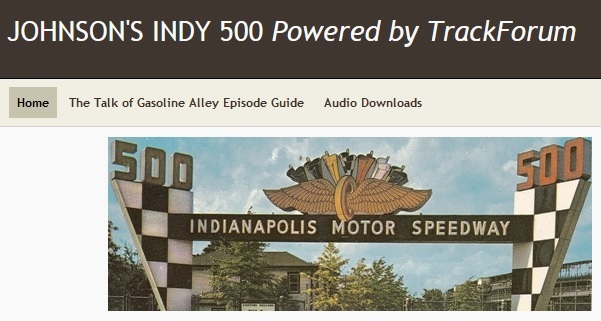 The radio program from 1070-AM WIBC/WFNI in Indianapolis took to the airwaves in 1971, and its daily question & answer style has provided a wealth of information about the Indianapolis 500 and Indianapolis Motor Speedway that is, and forever will be, unequaled. As a tribute, I delved into over a decade’s worth of episodes, creating a detailed episode guide for reference and research purposes. The original TOGA project was completed in 2014, and additions are being made each year as new episodes are produced. Going into the month of May 2016, I’ve documented and archived at least 338 episodes of TOGA. In 2015, the site was re-booted and re-branded with a new look and a new focus. The site will have more of an emphasis on unique nostalgia, personal experiences, and stuff that “no one else has done before.” With the highly-anticipated 100th running of the Indianapolis 500 approaching, I wanted the site to be ready to celebrate that milestone. I have seen your uploads to YouTube, but never thought about looking for a website. I’m glad I found you. Thank you for your work. You have helped rekindle my interest in the Indy 500 and IndyCar racing. 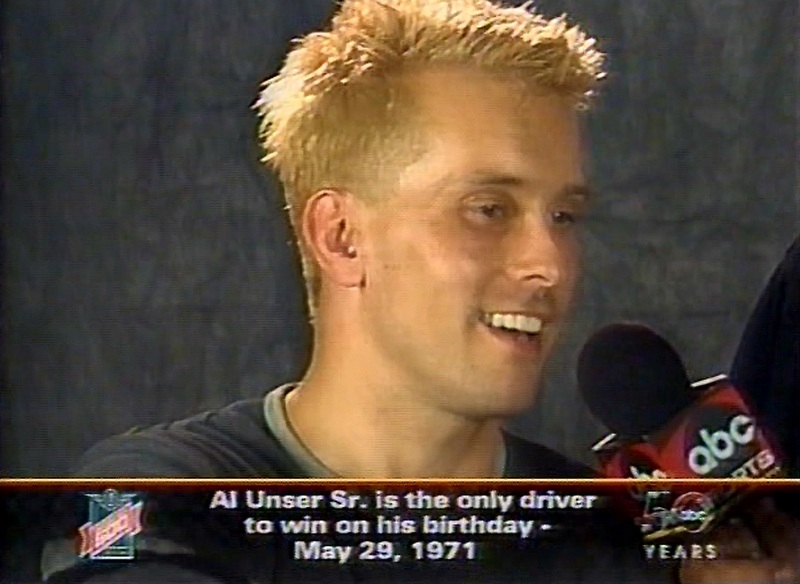 I recently returned to the Indy 500 out of nostalgia for an old board game, USAC Auto Racing. I decided to see if a VASSAL version had been done. It hadn’t, so I created one. I love history and wanted to create driver cards from long lost 500s. That’s when I found the videos you had uploaded. It’s amazing what a historical treasure trove exists of the old races. I have been hooked! I haven’t been this excited about indy cars in 30+ years.